A laptop computer that Rep. Debbie Wasserman Schultz, D-Fla., fought to keep prosecutors from examining may have been planted for police to find by her since-indicted information technology staffer, Imran Awan, a police report indicates. U.S. Capitol Police found the computer after midnight April 6 in a tiny room in a House office building that formerly served as a phone booth, according to a Capitol Police report reviewed by The Daily Caller News Foundation’s Investigative Group. Alongside the laptop were a Pakistani identification card, copies of Awan’s driver’s license and congressional ID badge, and letters addressed to acting U.S. Attorney Channing D. Phillips, a Democrat who is the top federal prosecutor for the District of Columbia. The laptop had the username “RepDWS,” even though the Florida Democrat and former Democratic National Committee chairman previously said it was Awan’s computer and that she had never seen it. Awan was banned Feb. 2 from the congressional computer network because he is a suspect in a cybersecurity investigation, but he still had access to House facilities because Wasserman Schultz continued to employ him. The laptop computer was found on the second floor of the the Rayburn House Office Building—a place Awan would have had no reason to go because Wasserman Schultz’s office is in the Longworth House Office Building, and other House members who employed Awan had fired him. Wasserman Schultz used a televised May 18 congressional hearing on the Capitol Police budget to threaten “consequences” if Chief Matthew Verderosa did not give her the laptop. “If a member loses equipment,” it should be given back, she said. She changed her story two months later, saying it was Awan’s laptop—bought with taxpayer funds from her office—and she had never seen it. She said she sought only to protect Awan’s rights. Awan, his wife, Hina Alvi, and two of his Pakistani-born brothers are at the center of a joint FBI-Capitol Police criminal investigation of their IT work for dozens of House Democrats. FBI agents arrested Awan on July 25 at Dulles International Airport outside Washington as he tried to board a flight to his native Pakistan. He was indicted on four counts of bank fraud in connection with his wire transfer of nearly $300,000 to Pakistan. The charges are tangential to the cybersecurity probe. The circumstances of the laptop’s appearance described in the police report suggest Wasserman Schultz was trying to keep police from reviewing a laptop that Awan himself may have wanted officers to find. The former phone booth room where police found the items is small, and there was no obvious reason to enter it. Leaving important items there accidentally would seem extremely unlikely, said Rep. Louie Gohmert, R-Texas, a former prosecutor who is a member of the House Judiciary Committee. The collection of documents found in the Rayburn building at 12:21 a.m. tied the laptop to Awan and ensured that police would keep the computer. The reporting officer wrote that when he saw Awan’s name, he recalled standing guard during an interrogation of the IT aide a few months earlier. The “attorney-client privilege” notation on the notebook prevented police from immediately reviewing some of the papers. On 4/6/2017 at 0021 hours, with the building closed to the public, AOC [Architect of the Capitol] informed USCP [U.S. Capitol Police] Rayburn offices of an unattended bag in the phone booth on the 2nd floor. The officer received the open-contents visible bag and prepared a found property report. Approximately 3-4 months ago officer was requested by SAA [Sergeant at Arms] as police presence of 4 individuals being interviewed, including the bag owner. It is unknown to the officer whether he is still employed. Although the laptop allegedly was used only by an IT aide who worked for numerous House members, Wasserman Schultz hired an outside counsel, William Pittard. Pittard has argued that the Constitution’s speech and debate clause—which protects a federal lawmaker’s information directly related to legislative duties—should prevent prosecutors from examining the laptop’s contents. Pittard did not respond to requests for comment. Pittard, a partner with the Washington law firm KaiserDillon, is the House’s former acting general counsel. Hiring an outside lawyer to argue on behalf of Wasserman Schultz appears unusual, because the House’s general counsel offers opinions on the constitutional speech and debate issues at no cost. Federal prosecutors in Phillips’ office have given Awan a copy of the hard drive of the House laptop left in the booth at Rayburn, court filimgs show, suggesting they intend to bring charges related to the underlying cybersecurity and theft probe. She knew, however, how serious cyberbreaches can be because she was head of the Democratic Party when its emails were hacked and released last year, leading to her resignation in July 2016 just before the Democratic National Convention, where delegates nominated Hillary Clinton for president. 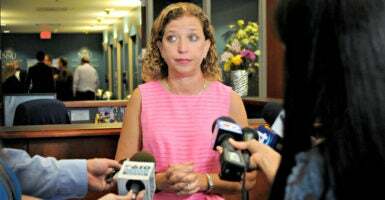 Awan had access to emails and electronic files of dozens of House Democrats. Their refusal to criticize him has raised questions about whether members may be afraid he could release their emails if they assist in his prosecution and whether some could be implicated in a kickback scheme involving disappearing equipment and ghost employees. David Damron, a spokesman for Wasserman Schultz, declined to tell The Daily Caller News Foundation why she would be so adamant the allegations against Awan were made up even after the IT aide apparently took her laptop late at night and left it where it would be found, alongside other evidence. Damron would not clarify why she first said the laptop computer was hers and she had lost it and then said it was Awan’s and she never had seen it, nor address the revelation that the laptop had the username RepDWS. Damron also would not say whether Wasserman Schultz thought Awan had connected to the House network using the laptop. Verderosa, the Capitol Police chief, said his agency kept the laptop because it was tied to a criminal suspect. If the laptop had been found by itself, it likely would have been returned. However, the collection of items left with it, including multiple IDs and references to a criminal case, ensured the laptop would be considered evidence. Bill Miller, a spokesman for Phillips, the U.S. attorney, declined to comment on prosecutors’ giving Awan “forensic images” of the laptop and hard drive. Wasserman Schultz’s brother, Steve Wasserman, is a lawyer in the Office of the U.S. Attorney for the District of Columbia. He has no role in prosecuting the Awan case, but tweeted an op-ed arguing that there should be no case against his sister.